President Trump is at a crossroads. He can either stop the caravan migrant invasion or see his presidency slowly crumble. Over 6,000 illegal immigrants are being sheltered at a sports complex in Tijuana, Mexico — just across from the San Diego sector. They are waiting for the rest of the caravan migrants — about 3,000-4,000 — from Honduras to arrive. Then they all plan to rush the U.S.-Mexican border and enter our country illegally. So far, nothing stands in their way. The U.S. troops deployed by Trump to bolster the Border Patrol have been stationed along the Texas border — a long way from the bulk of the migrant caravan. There are a few Border Patrol agents and vehicles at the San Diego sector, but they are no match for the nearly 10,000 invaders who are about to pour in. And after the first wave, there are three other caravans coming from Central America. The word is out: America’s borders are wide open and Trump is powerless to repel them. If the migrant caravan can bust through, it sets the ominous precedent that all of Central America can illegally enter the United States. Our southern border will be essentially erased. And America will be overwhelmed by Third World illegal immigration. The cost alone — in welfare benefits, taxpayer-subsidized health care and education, public housing, food stamps, rising crime and violence, drugs, and increasing ethnic and racial balkanization — will bankrupt us. This is no longer a political, cultural or ideological issue; rather, it is one of basic arithmetic. We cannot afford open borders and massive illegal immigration. Yet, the fiercest resistance is coming from an unexpected place: Mexico. Residents in Tijuana are rising up, demanding the caravan migrants be deported back to their home countries. The reason: The migrants are not only draining public services, but have committed numerous crimes during their trek up Mexico. Both the Mexican government and U.S. Department of Homeland Security (along with the Honduran and Guatemalan governments) say that a minimum of at least 500 criminals have infiltrated the caravan — murderers, rapists, MS-13 thugs, drug dealers and human traffickers. 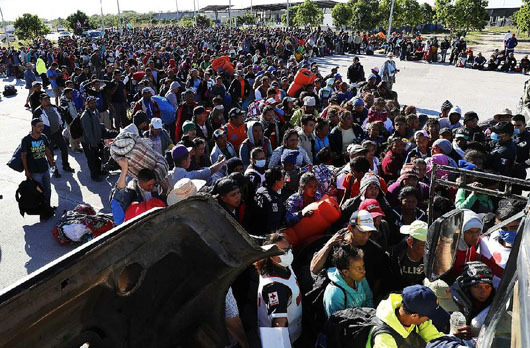 Contrary to media lies, the caravan is not composed of mothers and children; rather, over 90 percent are young, single males. The real number of criminals is probably closer to several thousand. At a press conference, the mayor was openly defiant. He rightly said that “no city” and “no country” could handle this “avalanche” and “tsunami” of poor, low-skilled people pouring in. Which begs the question: Are Mexicans racist too? According to our globalist elites, Trump and his supporters are xenophobic bigots for wanting secure borders. But by this logic the Tijuana mayor and the Mexican protestors are racists as well. So, non-whites supposedly hate fellow non-whites. Or perhaps the answer is more obvious and tethered to reality: Mexicans want to protect their borders, national sovereignty and country from a migrant invasion just as much as most Americans do. It is the basic instinct for survival. The only difference is that the people of Tijuana are still free enough to speak their minds. In America, especially in the mainstream media, universities, public schools, large corporations and Hollywood, such nationalist-populist sentiments are censored and banned. Trump is also being shackled by the liberal courts. On Monday, an Obama-appointed judge blocked the president’s asylum ban. Trump recently issued an order, stipulating that any caravan migrant caught illegally entering the United States between legitimate ports of entry cannot be allowed to claim — or be eligible for — asylum status. U.S. immigration law is clear: Asylum seekers must come into our country only through a port of entry. Trump was doing nothing more than reinforcing existing law. District Judge Jon Tigar, however, sided with the migrants. This is rich. President Obama himself rewrote our immigration laws “that Congress has expressly forbidden” when he unilaterally and illegally granted executive amnesty to over 700,000 so-called Dreamers. Hence, when Obama flouts Congress, openly breaks the law and carves out an entire class of illegal aliens for special exemption, the courts say — and do — nothing. But when Trump tries to prevent illegal immigrants from abusing our asylum laws, the liberal judiciary tries to shut him down. The historic invasion from the South is the greatest crisis facing America. Trump was elected primarily on this very issue. His seminal campaign pledge was to secure our borders, build the wall and begin deporting all criminal illegal aliens. The southern border, however, remains porous; the wall is not close to being built; and more illegal immigrants keep coming. We are reaching a critical tipping point. There are now over 22 million illegals residing in America. Millions more from Central America and Mexico will be pouring in unless this invasion is halted. Trump needs to act decisively — and soon. He should declare a state of national emergency, send 20,000 U.S. troops and militarize the southern border, and call for a moratorium on all immigration (both legal and illegal). He also must order the Army Corps of Engineers to finally construct the wall, and take the needed $25 billion from the huge military budget. In other words, it’s time to put America first. The caravan will define Trump’s legacy. Either he stops it or he’s doomed to be a one-term president. The choice is yours, Mr. President.